As a player, I was always looking for ways to keep my swing locked in. But over the course of an eight month season (or longer when I played Winter Ball) there were peaks and valleys when it came to my consistency and it drove me nuts trying to find the proper swing once again. As I began coaching my sons and training elite hitters in SoCal, the same exact issues would plague my hitters—one game their bat path and timing were perfect but the next game they looked disconnected and lost at the plate. One of the drills my dad used to have me do when I was in a funk was to gather a bunch of bats and head to home plate. He would tell me to swing and let go of the bat to a certain direction. So he would yell, “Up the middle”, and I would swing and let go of the bat, sending it flying. Often times I would fling the bat into the third base dugout telling me that I was pulling my front shoulder out. Or while trying to throw it up the middle it would go to the first baseman signaling that my hands “casted out” and/or I didn’t rotate my back foot. 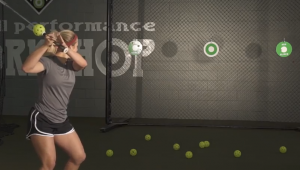 This drill was something that really helped identify the culprit to my disjointed swing. I used this for my young players until I discovered what I believe is the greatest training tool ever created for hitters—The ProGlider Training Bat. My day job is in marketing and advertising . About three years ago I was asked by my ad agency supervisor to look into a baseball training tool he saw on the internet. I went to their website and discovered a tool I had never seen but was super interested in trying out. The tool was the ProGlider Training Bat. I called their 800 number and a nice gentleman answered the phone on the first ring and I began my “pitch” to interest him into meeting with us to see if we could establish a mutually beneficial business arrangement. He agreed and we met bringing a ProGlider with him to the first meeting. Before we even sat down to chat, my supervisor (a former HS player) and I began to test it out inside our building. My first few attempts were not pretty as I shot the ball to the right over and over. The ProGlider inventor/owner, Alan Tande, calmly said, “You’re not rotating your back side so your hands are casting out early.” I couldn’t believe how quickly I actually “felt” the off timing from not syncing my back side up with my hands. The next swing I shot it way left and Alan calmly said, “You over adjusted and pulled your front shoulder forcing your top hand to accelerate too early.” Again I was totally blown away that he perfectly diagnosed the issue after just one swing. Finally, I took a deep breath, with everyone in my office watching, and shot a perfect line drive up the middle. I could totally “feel” how that swing was timed perfectly. I consciously was able to focus on getting my hands out while my back side cleared and flipped the ProGlider at the exact point needed. As we met, Alan elaborated on the origin of his idea to create the ProGlider and I was blown away. He said that he was a former Travel Softball Coach and his teams were always nationally ranked including an ASA National Championship team with many players going to college to play. He said that he used to help his hitters with drills especially his favorite drill—throwing bats to specific fields! I started laughing out loud as that was my dad’s favorite drill also! Alan then explained the science behind the ProGlider and I was completely hooked. Alan started to describe how the ProGlider was designed to create the perfect bat path using the principles of “Motion of Inertia” or MOI. 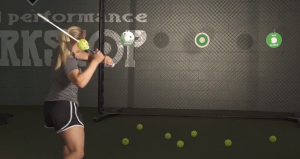 Pro Glider Review video showing how to hit the ball up the middle with the right form. I could immediately “feel” a good swing or a bad swing with or without the ball. The click from the ProGlider is set up for every bat size and weight to click at the proper time based on the MOI created by the batter. I began to imagine how I would have had a ProGlider in my personal luggage on road trips, swinging the ProGlider in my hotel room before we had to get on the bus to the visiting stadium. I’d also have another one in my baseball bag for work prior to hitting off the tee. This tool simply blew my mind. It’s so simple I have had five year olds “feel” the swing being late or early and without instruction, self-correct their swing. As I began to be asked by more and more players to train them, I asked Alan if I could offer my players a discount on purchasing their own ProGlider. He agreed and we began to form a great relationship that we still have to this day. Notice the first motion is a knob to the ball. This is what you must do with the Pro Glider to make work and perfect your swing. I love that my youngest players can get a 28” -12 ProGlider just like their game bat and my High School players can get BBCOR -3. The ProGlider bat is super durable and I saw one with an estimated MILLION swings! It was one of the first ones sold to softball legend, Jen Schroeder and her dad Mike, for use at their facility in Yorba Linda, CA. This million swing ProGlider still works like new, just the black anodized surface had been worn down to the silver aluminum from so much use. Recently we created a series of ProGlider videos using a high speed camera that can capture 2,500 frames per second. This is the same super slo-mo you’ll see on TV games where you can see the laces rotate on the pitch. TheProGlider video series details the origin of the idea for the bat, the perseverance Alan endured to get it produced and why it works so well keeping hitters in the proper bat path. The ProGlider keeps the swing consistent so peaks last longer and the valleys are less severe. Use an identified plate mat to help locate the right pitch and contact point for that pitch. 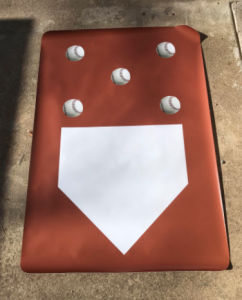 To further enhance the ProGlider experience, I have designed a portable home plate with target pitches for my players to use when using the ProGlider. This design is simple or you can use three baseballs placed on the ground also. I tell my hitters to focus on one of the balls and swing the ProGlider where that pitch is located. When I stand behind them, I can see where the ProGlider ball releases in relationship to the ball on the ground. This is an EXCELLENT drill for players who lock out their lead arm, drift forward with their head, neglect to rotate their back foot/knee, pull their front shoulder or roll over with their hands. The very first thing I do with all my players as we begin a session is to get them to control the ProGlider. If they can’t swing and send the ball from the ProGlider to the target, it’s useless to go to the next station. One of the D1 commits I train couldn’t control the ProGlider the first session we had together. It took 20 minutes before he finally hit one straight. But when he did, he “felt” the difference in his bat path and it has made him much more consistent by allowing his barrel to stay in the path of the ball longer creating a massive margin for error. The best hitters in the history of the game have one thing in common—they kept their bat in the path of the ball for a very long time giving them opportunities to barrel up a pitch late, right on time or early. There are some copy-cat inventions out there, but the patented ProGlider’s unique qualities of MOI are what separate this tool from anything else I’ve ever swung. To me, any player serious about improving their consistency by getting into the proper bat path needs to get a ProGlider. The principles of “Motion of Inertia” simply do not lie. The ProGlider gives hitters feedback they can “feel” and they quickly learn to self-correct their swing until everything “clicks” on time. A batting tee or soft toss drills don’t offer this type of feedback and I can’t think of any other training tool that instills the most important thing a hitter needs on a daily basis—getting into the proper bat path and staying there.